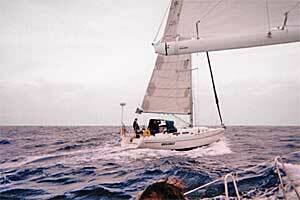 Boat : Hanse 371, Megawat , launched Dec 2001, ocean miles 14,000 approx. Crew : Philip Watson, Roger Cagney, Brian McDowell. 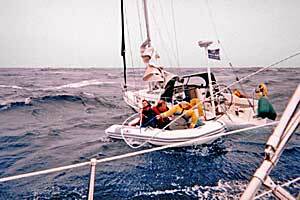 Date/Time : Wed 25th May 2005, mid-day approx., sailing to Scottish Series. Weather : 20 - 30 Kn. SSE. Sea State:- 1.5 m - 2 m swell. Position : South Rock Light vessel 20 miles ahead bearing 014 degrees. Liferaft : A hired Zodiac 6 - person. 5 years old, last serviced, Jan 2005. When surfing down one of the bigger waves at about 11 kn., there was a loud bang, like a pistol-shot. 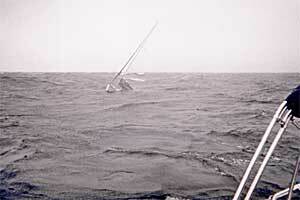 Helmsman Brian McDowell felt the wheel go "limp" and watched helplessly as Megawat rounded up sharply. I had been sitting in the companionway & Roger was lying down below. I asked Brian had the steering failed and he showed me, by spinning the wheel, that it was. At this time I suspected the (Lewmar/Whitlock) rod & ball-joint steering linkage had failed. 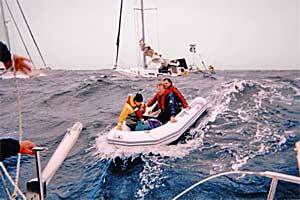 I went below, and having checked with Roger that it was appropriate to put out a Mayday on VHF CH. 16, did just that. The Coastguard answered immediately, received our lat/lon, and the info. that we were in no immediate danger. Roger and I spent the next few minutes pulling down the main, which is difficult with a fully battened main unless you are head-to-wind. We were lying broadside. At this time we could see that the N.Y.C. Jeanneau 54' Quite Correct, owned by John Roberts, and with our friends Brian Mathews and John Veale (Hammer!) aboard, was coming back towards us. An hour earlier she had passed us out so close by that we had a short and jovial conversation with them. When I next went below it was to discover an unwelcome development. Water was well over the floorboards, and shoes etc, were floating about. Time to radio the Coastguard again, and reveal the worsening situation. They confirmed having scrambled two lifeboats and a helicopter. 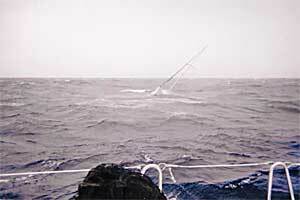 At about this time I spotted our rudder, with about half its stock attached, floating away from us. It was too rough when Quite Correct got back to us to attempt a transfer from yacht-to-yacht, without risking rig and hull damage to the rescuing yacht, and so I put the liferaft into the water alongside the cockpit and sharply tugged the painter line to inflate it. 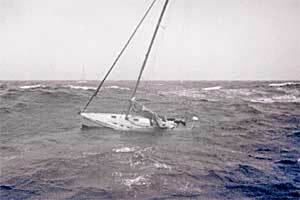 We hoped to get into it, let it away from Megawat on a long painter, and get aboard the 54 footer from the raft. Disappointment may not be quite the right word for what I was feeling when the hissing stopped after just 5 seconds, leaving about the right amount of CO2 for a life-jacket in the raft! We cut the hopelessly under-inflated raft away as it was likely to impede rescue. Water was now almost level with the companionway and we were eager (if at all possible) to have a dry transfer to the larger yacht, so we hailed them to launch their own dinghy, which was fully inflated on the foredeck. It's a RIB, about 11 feet long, so it took four crew to lift it over the rails, but they did it perfectly. They streamed it downwind to us on a long painter, and we were mightily relieved to get into it without the need for a spell in the cold water. We each brought a kitbag of gear, but inevitably, not the gear one would have chosen if you had an extra hour to consider it! The crew of Quite Correct, having got us all safely aboard, radioed the Coastguard, to "stand down" the lifeboat and helicopter, adding that Megawat would sink very shortly and thus be no danger to shipping. Aboard the luxurious 54', we circled for about 10 minutes, taking pictures, until she finally dropped her stern and sank in 66 m of water ... not I sight I would ever wish to see again. We were lucky! 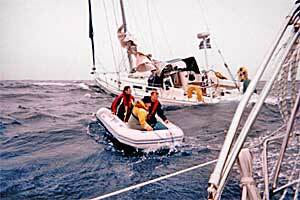 Brian Mathews had been masterly in his handling of such a large yacht at close quarters. 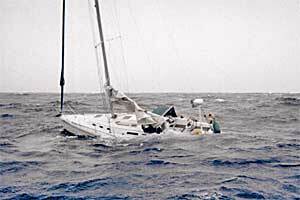 To have a "disaster" you need three things to go wrong, we had two ... the sinking itself, and the lack of an inflated liferaft ... if the VHF hadn't worked ... if it was dark ... if there were no other boats about ... if, if, if ? The very next day two members of the Hanse Yachts technical team flew from Germany to meet me, together with two members of the Irish Marine Casualty Investigation Board, (M.C.I.B.) who had in recent times investigated the Debonair and Cabin Fever accidents. Together we hope to find out why our rudder-stock snapped. At this time it is still a mystery how an 85 mm diameter solid alloy bar, as used in 600+ Hanse yachts up to 41 feet long, and in hundreds of thousands of other yachts world-wide, should fail where it failed. When a rudderstock breaks, it is almost always at the bottom bearing, and often as a result of a previous grounding, which definitely did not happen in Megawat's case. Because it broke roughly half way between the bottom bearing and the top bearing, just below the point where the quadrant is clamped around a "key", the part of the stock still attached to the blade exerted massive leverage on the bottom end of the rudder tube. The stock probably broke the tube off the inside of the hull, leaving a hole big enough to take in a couple of hundred gallons per minute, which allowed her to sink just 40 minutes after the catastrophic stock failure. Currently, efforts are being made to recover the rudder, which is probably on a Co. Down shore, to examine in great detail the type of break, and possibly if this isn't found the MCIB might feel it worth the resource to look at the other side of the break on the sunken yacht, which might be easier to find?